This article follows the layout of the Barbarian Invasion Hosted Modifications forum at TWC. Except in respect of some mods (e.g. 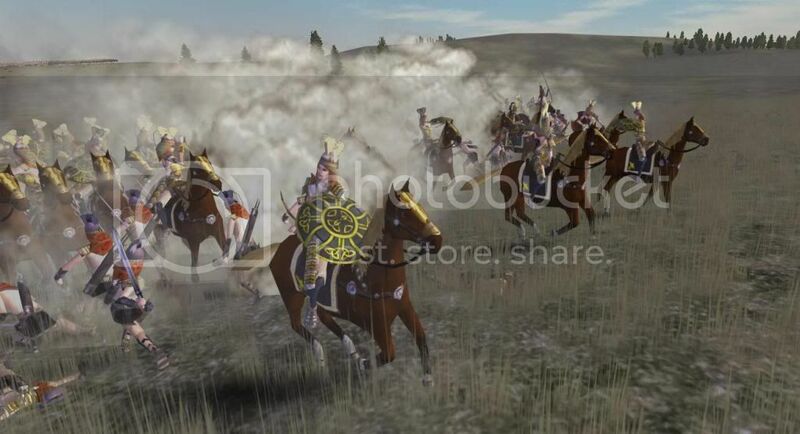 Troy Total War) which are hosted in wrong section for the platform eventually used by the mod. This section includes mods with open beta and / or minor releases. AKA Amazon:Total War 6.0, Amazon:Total War-Reignited is a tribute to the ancient matriarchal culture, it is about a fictional uprising of the matriarchal societies after the death of Alexander, attempt to end the world the rules of men, and to restore peace and sanity to the world. Set at the same time as RTW (ie 270BC), but with a complete new twist. Featuring advanced technological weapons based on archeology and latest extrapolation of anthropological data, numerous female fighting units, and a new Amazon Culture where matriarch rules. Each Amazon factions (there are four), as well as Carthage and the Sarmatians have their own quests to complete in order to achieve the dominance of the Europa Ecumene. This mod introduces the concept of Balanced Unit Modeling, that is, close attentions were given to make sure there is a direct relationship between the equipment (in the form of animation skin or texture) and the infrastructure of the supporting community. Unlike many previous mods, no longer a fighting unit of 160 warriors with texture showing full suits of chain mails can be recuited from a tiny villages of 700 souls with a lone metal smith in town. Shown above and below are the actual screen shots at reduced resolution. Installation Type: Contained entirely within its own mod-folder under RTW/BI main folder as the peer to RTW data folder; Folder Name:AmazonTW-Reignited, compatible with other mod-folder mods and vanilla games on same installation. Arthurian Total War is a mod focusing on Northern Gaul and Britain with a staring date of 481 AD. It is a total conversion including; a new map of Britain and part of France, all new factions and scripted campaign play for greater difficulty. Chivalry Total War, once known as "MTW Mod", brings the medieval theme to RomeTW, from 1072 to 1453AD. This total conversion takes aims at a well balanced MP experience and an exciting SP campaign. Designed to run on RTW 1.5 and BI 1.6. Historic modification focusing on the medieval times of warfare. A modification for BI 1.6, chronicling the rise of the Satanic nation of Magog, End of Days will transport you into an alternative history of darkness and evil. There are seven playable factions including; the Kingdom of Albion, the Nation of Islam, Francia, Germanicae, the Shambhala (Buddhist warrior monks), Hispania and the Satanae. The action starts in 666ad as the Dark Lords begin to gather their forces to bring darkness to the world and pave the way for the Anti-christ. Installation Type: Contained entirely within its own mod-folder; bi/eod (except for intro movie), compatible with other mod-folder mods and vanilla games on same installation. The Fourth Age: Total War is a full-conversion modification for BI 1.6. With an aim to staying true to the works and spirit of J.R.R. Tolkien's world of Middle-earth, whilst also aspiring to original creative excellence, the Fourth Age: Total War is set to be a must-have for anyone who loves the setting and peoples of Tolkien's mythic world. The Forth Eorlingas-expansion pack adds two new factions to the old Corsair Invasion mini-campaign; The Kingdom of Rohan and The Chiefdom of Dunland. The other playable factions are The Reunited Kingdom (of Gondor and Arnor), The Empire of Harad, and The Chiefdom of Rhûn. It has an expanded map, now including roughly half of western Middle-earth, with five wonders; The Stone of Erech, The Ruins of Osgiliath, Edhellond, The Treegarth of Orthanc, and The Argonath, 3 unique cities Minas Tirith, Helm’s Deep, and Edoras, and three Marvels (wonder-like structures): The Sea-ward Tower (Tirith Aear), The White Tree of Gondor, and The Gardens of Ithilien. The hosted forum for The Fall of the Republic - Rise of the Empire (known as FRRE)incorporates both The First Triumvirate and the 77 BC mods. The FRRE mod itself does not currently exist as originally envisaged. The premier Mod set in the timeframe of Rome Total War:Barbarian Invasion - experience the world at the end of the Roman era, before the west is plunged into the Dark Ages, experience TOTAL WAR! The year is 410AD, the Roman Garrison in Britannia was shipped to Gaul by Constantine III, the usurper. Britannia, beset by raiding Picts and Saxons, asks for help from the Roman Emperor in the West, but was told to fend for themselves. The Western half of the Empire is beset by it's own troubles, aside from the Army of Constantine III which had overrun Gaul, the Vandals and Alans have reached Iberia, the Visigoths are at the gates of Rome, the Burgundii at the borders. These Germans have been driven westward by a greater host - the Hunnic hordes, sweeping everything in their path, they now stand on the threshold of the western lands, and will start inroads into the West Empire and the East Empire very soon. The East Roman Empire is beset by the Ostrogoths, also driven west by the Huns, and to the east the great Empire of the Sassanids, with their great cataphract cavalry. But the Sassanids are also being torn apart in the East by the Hephthalites, another great nomad horde. No one is safe, the world is in turmoil, there is no knowing how it will end... This is INVASIO BARBARORUM! This is TOTAL WAR!!! End of Days: Lycan Rising a completely independent sequel to End of Days, the mod is based on an invented pre-history of ongoing warfare between Lycan and Vampire races. See Chronicle of the Nightbreeds for the book the mod is based on. Ogniem i Mieczem (With Fire And Sword) is a major modification to a well known strategy game Rome: Total War. The modification is focused on events which took place in Eastern and Central Europe in XVI-XVII ages. The unique tactics and strategy for each faction are based on unique lines of buildings, upgrades and units. The atmosphere in the game is maintained with authentic symbolism of the states of that period. The interface is made according to the spirit of the age. Military quotations of that period are also included. Historical accuracy is the main strong point of the mod. The starting conditions of the campaign correspond to the real political, strategic, economic, demographic and military set-up at the year of 1569 (campaign starting date). Events drastically change during the campaign. To win you always have to be ready to show your supreme mastery of strategy and tactics. Campaign ends at the year of 1700. This date symbolizes the beginning of a new military age. So if you think Rome: Total War is finished, you are definitely mistaken! The main battles are ahead! Smash your enemies With Fire And Sword in the Total War! Ancient China is caught in the flames of war again! Step into the era of the Three Kingdoms and reunite the Empire and create your own dynasty! Troy : Total War (TTW) is a mod for Rome Total War Barbarian Invasion based on the trojan war. Total modification created by Vlad aims to give a unique experience with many re-texured units and historical units, focusing on the balance of fun, uniqueness, units and accuracy! Ancient Wars is a mod for BI 1.6 focusing both on historical accuracy and enhancing the gameplay through two unique campaigns. It will include new map, units, music, GUI and more. This mod spans from the beginning of Pyrrhus' invasion until the death of Nero. Our mission is to create the most realistic and historical mod as is possible. A total conversion about what could have happened to the survivors of Atlantis. Being a fiction the mod intends to give something fresh and enhance both game play and graphics. Hegemonia city states is a complete modification of Rome: Total War based on BI. The mod is dedicated to Hellenic history and the wars of the Hellenic people from late 6th century to the Peloponnesian wars. Moria: Total War is a modification of Rome:Total War BI. Based on J.R.R. Tolkien's Middle-earth, which covers the campaign to retake the Dwarf city of Khazad Dhum. 3310 of the Second Age of the Sun. Ar-Pharazôn, King of Númenor, is influenced by his 'prisoner' Sauron, and has started the Great Armament in preparation for an invasion of Valinor. His aim: to take the gift of immortality by force of arms. Paeninsula Italica is a historical mod, with the timeframe of 338-222 B.C., and with aims to recreate the great struggles for the supremacy of Italy. In this mod we are aiming to portray Italy in the late fourth century BC. After a hundred years since the founding of the Republic, Rome has grown considerably in power. It has dissolved the Latin League in 338 B.C. and has taken up the leadership among the states of Latium. In the center of the Peninsula are the powerful Etruscan League, the Sabini and the ancient nation of the Umbri. Even further to the north are teeming hordes of Celtic Insubres, Cenomani, Boii and Senones who have invaded across the Alps into the Po Valley, and entirely obliterated the old Etruscan dominion there, settling in an area neighbouring by the warlike Ligures, the Veneti and the Rhetic tribes. To the south are the hardy Sabellian tribes collected on some powerful leagues: Sabelli, Samnites, Lucani and Brettii. On the southern Adriatic coast are the Ipygian tribes, grouped in two major confederations: the Apuli and the Messapii. Some of the ancient Greek cities still survived and are collected in the "Italiote League" led by Tarentum. The rich Sicily is still contended by Chartage and the great city of Syracuse. News has arrived that Alexander of Epirus, uncle of Alexander the Great, has just landed with ambitions for the whole peninsula. This page was last edited on 20 October 2018, at 07:04.